The classic French pairing of duck confit and lentils inspired this dish of crispy-skinned, succulent chicken thighs atop a savory combo of sprouted beans and sautéed pumpkin seeds. Inexpensive chicken thighs cook up moist and tender and the gluten-free, grain-free, low-carb side rivals the original starchy version for depth of flavor, but with a unique texture and a bit of crunch. Tip: I used a dried mix of sprouted lentils and adzuki and mung beans from TruRoots®, but other combinations are available. You can also substitute chopped, raw cauliflower for half the beans to lower the carbs even more. 2. Dice onion, celery, and red pepper and mince garlic. Pull ½ cup leaves from parsley and chop. 3. Blot chicken dry with paper towels and sprinkle generously with salt and pepper. Set aside. 4. Chop bacon and place in a large, oven-safe skillet over medium heat. Cook, stirring occasionally, until bacon is crisp and fat is rendered, 4 to 5 minutes. Remove bacon with a slotted spoon and reserve. 5. Put pumpkin seeds in skillet and cook and stir until lightly browned. Remove with a slotted spoon and add to reserved bacon. 6. 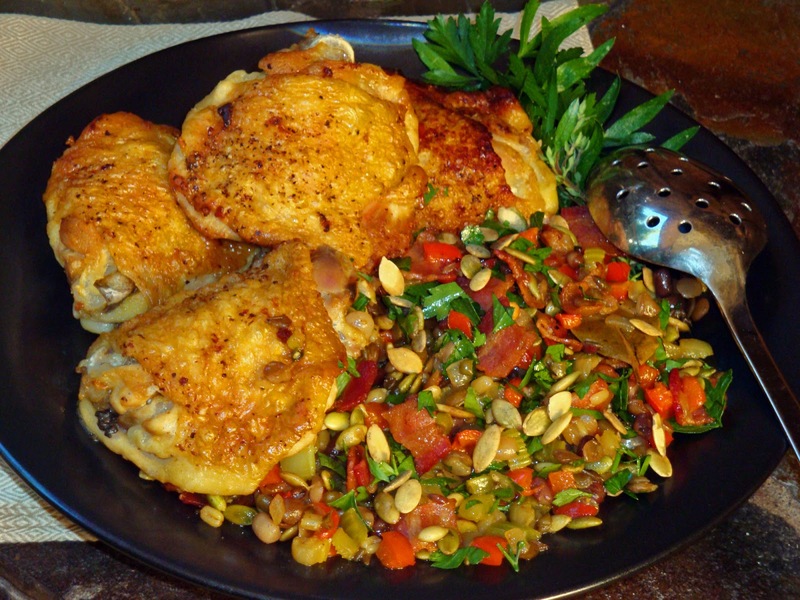 Raise heat to medium-high and place chicken thighs in skillet, skin-side down. Cook without moving until skin is golden brown and crisp, about 5 minutes. Turn and cook for another minute. Transfer to a plate and reserve. 7. Pour off all but about 2 tablespoons of fat from pan and add onion, celery, and red bell pepper. Cook, stirring occasionally, until softened, about 6 to 7 minutes. Add garlic and cook about 1 minute more. Stir in bean and lentil mixture and add bay leaf and thyme to skillet. 8. Place chicken, skin-side up, on top of vegetables and add any meat juices from plate to the skillet. Pour chicken stock into pan so it comes about two-thirds of the way up the sides of the chicken but doesn’t cover it. Bring to a boil. Transfer skillet to pre-heated oven and bake, uncovered, for 45 minutes to 1 hour or until chicken is tender and skin is very crisp. Remove chicken pieces to a serving platter and keep warm. 9. Return skillet to cooktop over medium-high heat. Add wine and cook 3 or 4 minutes or until most of the liquid has evaporated. Remove bay leaf and thyme. 10. Stir in parsley, reserved bacon, and pumpkin seeds and heat through. Taste and add salt, if needed, and black pepper to taste. Spoon into serving dish, place chicken pieces on top, and serve. Calories: 470;* Protein: 25g; Fat: 32g;* Fiber: 6.8g; Total carbs: 13.6g; Net carbs: 6.8g. Note: *The fat and calories given in the nutrition counts include everything on the ingredients list, but some of the fat is poured off. Bacon, Chicken thighs, One dish meals, Pumpkin seed, Sprouted beans. Bookmark. It looks pretty yummy Judy! I've "ilked" it and repinned it. I adore chicken thighs, my favorite part of the bird. It looks pretty yummy Judy! I've "liked" it and repinned it. Liked and repinned. Good luck! Thank you, thank you! It looks like I get 2 comments here when you repin. Not sure why, but I'm not complaining!